Boston Medical Center Farmers Market! Volunteer days are Tuesdays, Thursdays (starting this week) and Saturdays (starting September 12) from 9:30 am to 12:30 pm through October 31st. Every Tuesday and Thursday, we'll be harvesting the produce that goes to market. On Saturdays, volunteers are led in doing field work by the awesome young people in the Academic Year Program. Come meet them! japanese eggplants Eggplant, a nightshade, produces a beautiful fruit (botanically classified as a berry) which is a versatile ingredient. Named “Eggplant” because some of the 18th century European cultivars were white and resembled a goose egg, it can be prepared in a variety of ways. It can be stewed, roasted, mashed, or sliced, breaded, and fried. I’ve even seen it used to encase a pasta pie, called Timbale. Eggplant is capable of absorbing large amounts of cooking fats and sauces, allowing for very rich dishes, but roasting it is delicious too. Eggplant has been cultivated in Asia for thousands of years and became known to the Western world around 1500 CE. 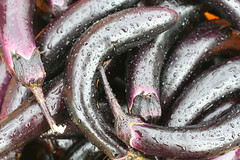 The different varieties of the plant produce fruit in wide range of size, shape, and color, though there are two purple varieties that are most common in the United States The most common is a large bulbous variety (affectionately described by wikipedia as an elongated ovoid), and a narrower Chinese variety (sometimes called Japanese eggplants) is also popular. 85% of the world’s Eggplant comes from China, India, and Egypt, so we at The Food Project are happy to be doing our part to provide our friends and neighbors with this culinary treat without all the shipping. Enjoy! Sprinkle eggplant slices with salt and set aside for 30 minutes. Rinse and pat dry. Heat oil in a large skillet over medium-high heat. Lightly brown eggplant and zucchini slices on both sides; drain. Adding more oil if necessary, brown potato slices; drain. Saute onion and garlic until lightly browned. Pour in vinegar and reduce. Stir in tomatoes, lentils, 1/2 the juice from lentils, oregano and parsley. Cover, reduce heat to medium-low, and simmer 15 minutes. In a 9x13 inch casserole dish layer eggplant, zucchini, potatoes, onions and feta. Pour tomato mixture over vegetables; repeat layering, finishing with a layer of eggplant and zucchini. Cover and bake in preheated oven for 25 minutes. Meanwhile, in a small saucepan combine butter, flour and milk. Bring to a slow boil, whisking constantly until thick and smooth. Season with pepper and add nutmeg. Remove from heat, cool for 5 minutes, and stir in beaten egg. Pour sauce over vegetables and sprinkle with Parmesan cheese. Bake, uncovered, for another 25 to 30 minutes.